Day One of the 2010 Advent Calendar. I should warn you newcomers: there will be show tunes. I love this song. I also love the mechanics behind this song. “Reviewing The Situation” is from the classic category of Show-Stopping Numbers. In a novel, you just write whatever the hell you want. In movies, the script passes through several hands and the finished product ultimately cowers to what can be physically accomplished, given the film’s budget and the limited wilingness of the public to just sort of shrug off a production-related death or three. In live theater, there’s another factor: a real actor is involved and he has to be engaged with his performance every single night for months. He’s going to want to have something to do besides set the expositional table for other actors. PG Wodehouse — certified by all right-thinking people as One Of The Greatest Damned Novelists Who Ever Lived — wrote a lot of theater in his early days. He said that he used much of the same kinds of thinking when writing the novels. He regarded each character not as a living, breathing person, but as a living, breathing actor who would be performing that role; if, for some reason, the story seemed to drag, he pictured one of his actors complaining that the rest of the cast has all of the great scenes and that his character does practically nothing but stand around holding a tennis racquet and saying “Gosh!” until Act Two. So Wodehouse, after assuring himself and his actor that the character is way too important to be cut, would make sure that the actor has plenty to do and that he or she has at least one moment in which they’re indelibly in the spotlight. I often think of this when I’m watching live theater or listening to a soundtrack and I come across a number like this. If you were trying to cut a half an hour from this show for the Las Vegas cast, this would be one of the first numbers to go. It isn’t one of the big hits and though it gives Fagin a little added depth, that whole hunk lifts straight out cleanly. 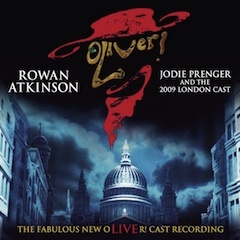 I know nothing about how “Oliver!” was written but I can so easily imagine the producers commissioning this number late in the game, when they realized how well their Fagin was working out, and how eager the preview audiences were to see more of him. How’s his singing? Okay, agreed: clearly, the lucrative seduction of television and stage comedy didn’t rob the music world of an exciting new talent. But mere technical perfection is a low goal for any singer, particularly in musicals. Hitting every note perfectly (and still having air in your lungs with five minutes down and one more minute to go) isn’t what lifts the audience out of its seats. It’s the performance. Atkinson isn’t singing the song…he’s acting it. Brilliantly. Don’t take my word for it. This is a recording of a live performance of the show and you can hear how well the number’s going over. Can’t you picture what Atkinson is doing to sell every line? I really wish all musical cast albums were recorded this way. There’s an energy here that probably wouldn’t have come through in a studio. It’s sort of like the difference between footage of a pro basketballer dunking during a real game in which every point matters, and the footage of that same athlete doing the same move on an Electronic Arts motion-capture stage. It’s still early to tell whether this 2009 recording will stand the test of time. I can say something right now: it’s withstood the test of AppleScript. Yesterday, I spent a little time building some scripts to automate the posting process. I highlight a track in iTunes, click a script from a menu, and whoosh: a block of CSS-formatted HTML is ready to be pasted in, complete with the track info, and a properly-resized version of the album art is ready to be uploaded. But my programming skills rely heavily on the Braille Method. I need to feel my way around it before my code does what I want it to. I must have listened to this track ten times in a row before I got everything working. Did I get sick of it? Hell, no. I went out to dinner and listened to it three more times on my way to the restaurant. Preview “Reviewing The Situation” on the Amazon MP3 Store. Macworld Expo is now over. I have put myself into Recovery Mode, in which I get to lie perfectly still in my hotel bed without having to stand, run anywhere, speak to anybody, or listen to anybody speaking to me. The past few days have all been wonderful, don’t get me wrong, but after 96 hours of it I’m ready to recant anything negative I might have ever said about staying put and doing nothing. And so, I spent Saturday evening hanging out with my good pal Dave, whom I’ve known since junior high. And not with my mattress and pillows, which I’d barely been acquainted with since I checked in on Tuesday, but which I desperately wanted to get to know better. They seemed like decent folks with a lot to offer an exhausted journalist. It was a fine trade: dinner in Chinatown followed by dessert in North Beach, two areas bustling with activity and things to see on a beautiful Saturday night. During the walk back to Dave’s car, we passed by the popular landmark shown above. On this site there once stood a famous bookstore known as “City Lights.” I don’t know when it finally went out of business. Sometime during the Ford Administration, I think. But it’s a fixture on the tourist circuit so the City took control of the property and chose to maintain City Lights’ traditional facade and front windows, and staff it with historical reenactors playing the part of bookstore staff, so that tourists could get a sense of what City Lights must have been like, back in the day. Yeah, I know. They’re not fooling anybody. But it’s a good show for the out-of-towners. So I stepped up to the “counter” and asked the “clerk” where I’d find books by P.G. Wodehouse. It wasn’t an off-the-wall question. Sometimes Wodehouse is shelved in Comedy, sometimes in Fiction, and sometimes — most appropriately — his books are found in the Classics department. The clerk searched the database. Yes, the computer was a historical anachronism for a 1960’s bookstore but I let it pass. Finding nothing in inventory, she called out to a fellow employee. “Where’s do we keep the Wodehouse?” she asked him. He’d blown it, of course. That doesn’t happen in real bookstores, does it? The 20th century (19th century, actually) produced no greater or more important novelist than Pelham Grenville Wodehouse. You can argue that point. But do understand that if you’re arguing with anybody whose IQ higher than the square root of itself, then they’re just leading you on. They’re really trying to determine just how deep your intellectual ignorance actually goes, having just realized that this is in fact the only sort of intellectual depth of which you are even capable. I wasn’t there to make a scene or ruin the illusion for the other out-of-towners. So I merely bade my goodbyes in the fashion customary to the time period during which the actual City Lights Bookstore had been in operation (a foggy “Keep on truckin’!” followed by a quick query as to where one might purchase some cocaine tablets) and took my leave. I bet it was this fellow’s first day. He was a terrific actor, anyway. For a moment — a moment — I actually believed that this “City Lights” was a real bookstore and that this “Paul” person (presumably Paul Yamazaki, a fictional character described on the “bookstore” site as “Chief Book-Buyer”) actually had chosen to run a bookstore in which the works of P.G. Wodehouse would never be sold. I know: how silly of me. It’d never happen. 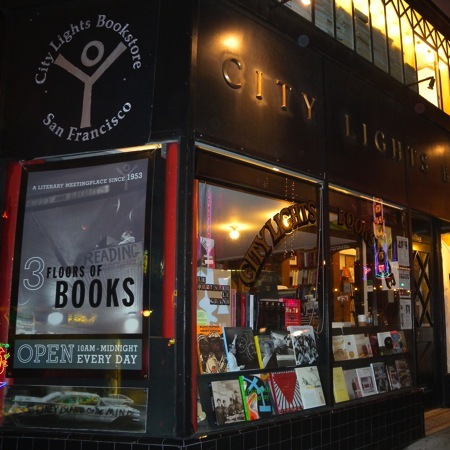 It makes much more sense that City Lights isn’t a real bookstore. I mean, I’m right either way. Either this is indeed a historical reenactment of what the “real” bookstore once looked like…or else City Lights Bookstore cannot in any way whatsoever be seriously thought of as a seller of literature. Tourist destination, sure. But bookstore? No way.